Don't panic if you don't have 12 matching shot glasses. You can mix and match, or even use espresso cups. Make chocolate shavings by running a Y-shaped peeler down the block of chocolate. Chill until needed. Divide the biscuits between the glasses and pour over enough Kahlúa or Tia Maria to drench them. 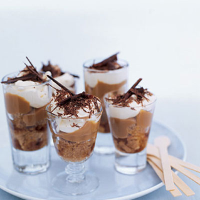 Now drop 1 tablespoon of the caramel sauce into each glass and top with whipped cream. Decorate with the chilled chocolate shavings and serve immediately. This recipe was first published in Mon May 01 01:00:00 BST 2006.